Last Friday I popped into Rainham in search of the juvenile Glaucous Gull that had been seen on the Tip and around the Stone Barges on the Wednesday, my initial search drew a blank in both areas, so I went and viewed the reserve from Wennington (Serin Mound) and picked up a distant gull roost on the adjacent marsh as you look towards the old silt lagoons. Although distant I picked out the distinctive biscuit coloured tones and pale bill (dark tipped) of a juvenile Glaucous Gull amongst the gull flock. I hadn't been watching the bird for long before a Marsh Harrier spooked the roost and I lost sight of the bird in the confusion, most of the gulls regathered and landed partially behind a reedbed on the marsh, but the Glaucous Gull had either flown off or was disappointingly out of view. Earlier, whilst searching for the Glaucous Gull I picked out two colour-ringed Common Gulls stood on the metal gantry which juts into the Thames from the Stone Barges car park. After emailing the ring information to the relevant coordinator, I've now received the life histories of both birds and remarkably they were both ringed as chicks in May 2008 in the same colony at Kakrarahu on the Matsalu Nature Reserve in Estonia. Common Gull P9U0 was recorded in Sweden at Vambasa (east of Romneby) in November 2012 but apart from that single sighting neither bird has ever been recorded away from the nature reserve in Estonia. Both Common Gulls are males and have been observed nesting amongst the colony of Gulls at Kakrarahu every year since 2012. 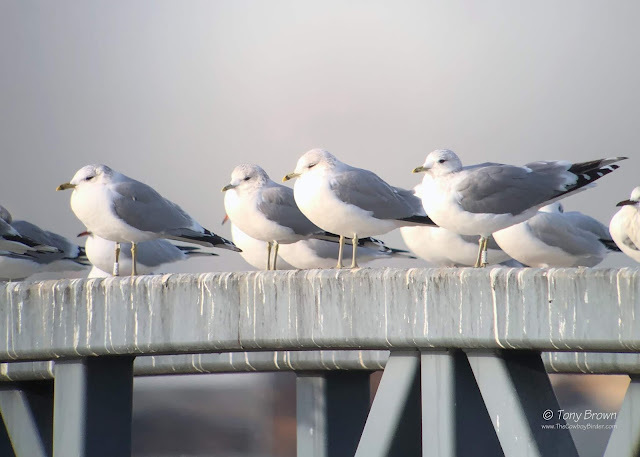 The birds have travelled over a 1000 miles to spend the winter in the UK and were stood just a few feet away from each other at Rainham - what are the odds on that?